Miriam-Webster's Dictionary defines a worm as "any of numerous relatively small elongated usually naked and soft-bodied animals (as a grub, pinworm, tapeworm, shipworm, or slowworm)". In my mind, I picture the night crawlers I used to get to go fishing in Barton Creek, but since the term applies to the shape of these invertebrates, it also covers the creepy crawly larval stage of beetles, butterflies and moths. 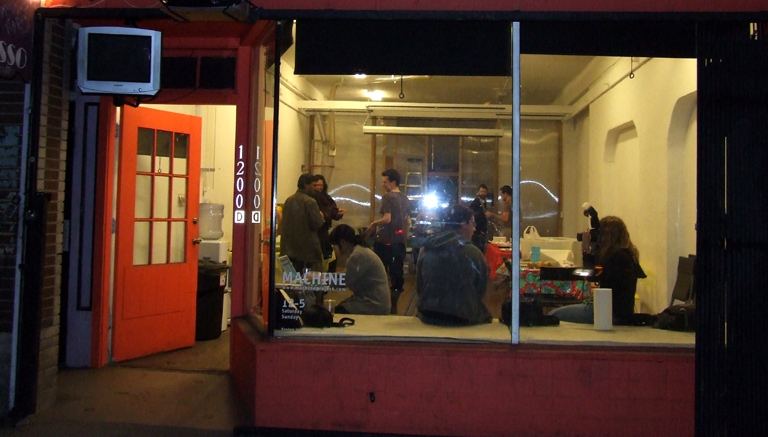 When I heard that Machine Project (a storefront space that experiments in technology, science, and the arts) was holding an event entitled "Eat Bug Eat", I was intrigued. Although it sounds like the title of a Japanese monster movie, the event was held to educate people in the culture and custom of eating insects. 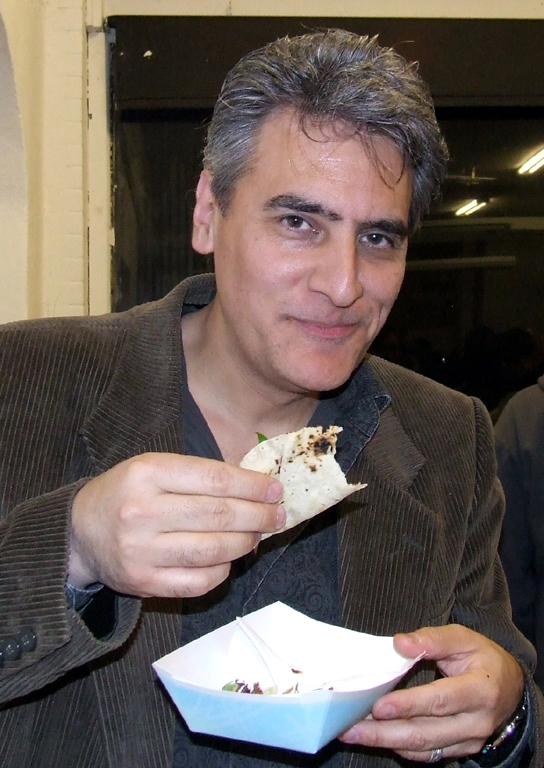 Although I'd eaten insects many times before, from the crunchy snack-like hormigas culonas to the grassy-tasting silkworm pupae, I succumbed to the come-hither of wax moth larvae tacos. The space is well lit and sparse, a good place for shows, events and installations. Several tables were topped with insect displays, a two-burner hotplate, a food preparation area, insect "farms" and bowls of glistening mead. For those who aren't familiar with mead, it is an alcoholic beverage made with honey (sometimes leaning towards wine, other times towards beer). The event featured Chaucer's and Rabbit's Foot mead, both light and white wine flavored, but close enough to being an insect product to be an acceptable beverage for the event. In various plastic tubs and steel bowls were the evening's appetizers and entrees - live, wriggling insect larvae. There were three kinds of worms on the menu: mealworms (the larval stage of the mealworm beetle), superworms (darkling beetle larvae) and the larvae form of the Greater Wax Moth. Some bowls of the fried worms were prepared earlier to munch on while waiting on the tacos, but one of the folks staging the event demonstrated the preparation. This involved simply pouring the writhing insects into frying pans with a little oil, and let me tell you, like me and just about any other life form I can think of they do not like to be cooked. The chef explained that they die rather quickly, but the heat applied to their bodies flexes them, which makes it look like they're still moving around. Although a few diners felt that this was somewhat cruel, the thought of what happens to a cow or pig when it gets butchered made this look like a mercy killing. There were also some locally made chapulines on hand, but they weren't made on the premises. 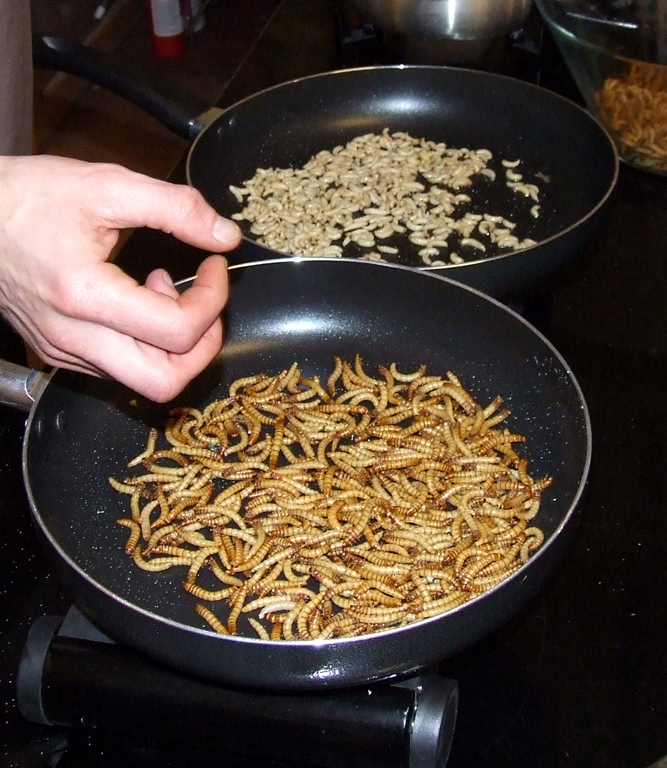 This entry was posted in Trippy Food (Tasty flora and fauna), Trippy Happenings (Events), USA and tagged CA, chapulines, larvae, Los Angeles, Machine Project, mealworms, superworms, wax moth, worms. Bookmark the permalink.